Young woman hands receiving spa therapy. Female hands in glass bowl with water and flowers. Spa healing for hands. Close up view of a young attractive woman with closed eyes, lying on the cosmetologist’s table and having the steam cleaning procedure of the face. Taking care of the health, luxury spa. 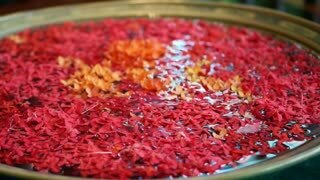 Beautiful hands in aroma bath, slow motion. Elderly woman hands with luxury manicure receiving spa treatment in beauty salon. Skin care and health. Reflexology foot massage to man. Thai spa foot treatment by wood stick outdoors. Healing benefits of foot reflexology massage. 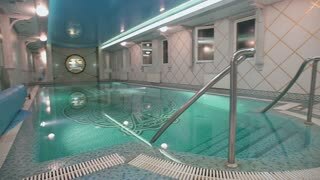 Interior of wellness and Spa swimming pool.Hotel pool. Swimming pool inside a hotel. Hands in glass bow with chrysanthemums. Young woman in spa salon receiving spa treatment. Skin and nails healing. Man relaxing in hot tub whirlpool pool jacuzzi at resort spa wellness pool outdoor at luxury resort spa retreat. Happy young male model relaxed resting in water on holiday travel. Jacuzzi at resort Spa wellness - woman relaxing in hot tub whirlpool pool outdoor at luxury resort spa retreat. Happy young mixed race Asian Caucasian female model relaxed resting in water on holiday. Spa wellness - man relaxing in hot tub whirlpool jacuzzi outdoor at luxury resort spa retreat. Happy young male model relaxed resting in water on vacation travel holidays. Spa wellness - woman relaxing in hot tub whirlpool jacuzzi outdoor at luxury resort spa retreat. Happy young mixed race Asian Caucasian female model relaxed resting in water near pool on vacation. Almond oil composition used for cosmetics, spa, wellness centers. Perfect body oil and moisturizing skin. Concept of: beauty, oils, creams, wellness. Well-groomed hands having spa, slow motion. Senior woman hands receiving spa procedure for hands in beauty salon. Skin care and wellness. Beautiful young bikini woman holding pink air mattress. Bikini girl relaxing in tropical in summer. The concept of travel, beach, beauty, spa, health, perfect body. Sun lens flare. slow-motion. Close view of male therapist doing anti cellulite madero therapy hand massage to attractive sporty sophisticated woman, lying on green towel. Relax, spa, health concept. Young beautiful female is relaxing during a turkish soap massage in a spa wellness center. Young attractive female stands in water in a pool in a spa wellness center. Two attractive girls in swimwear are relaxing in a steam bath in spa wellness center. Young man and woman are walking along the poolside in towels in a spa wellness center. Man and woman are using a tablet computer near a pool in a spa wellness center. Man is using a tablet computer near a pool in a spa wellness center. Attractive woman is using a tablet computer near a pool in a spa wellness center.